The Tirpitz Bunker started construction in August 1944 in Blåvand, Denmark, and was build as part of the defense around the seaport city of Esbjerg, located about 200 miles west of Copenhagen. It measured 7,500 square feet. Following the surrender of the German forces, construction was halted, and the bunker was therefore never completed. The bunker was designed to house 2 turrets with 2 38 cm SK C/34 naval guns each. After the war, the bunker was abandoned and later turned into a small museum. In 2012, it was decided to expand and completely redesign the museum, with Bjarke Ingels Group being chosen as designer for the new museum. The new museum features open spaces and is build into the dunes. On 29 June 2017, an opening ceremony was held, with the Crown Prince and Minister of Culture attending. As BIG tells on its website, the new TIRPITZ is a sanctuary in the sand that acts as a gentle counterbalance to the dramatic war history of the site in Blåvand on the west coast of Denmark. The 2,800 m2 ‘invisible museum’ transforms and expands a historic German WWII bunker into a groundbreaking cultural complex comprising four exhibitions within a single structure, seamlessly embedded into the landscape. 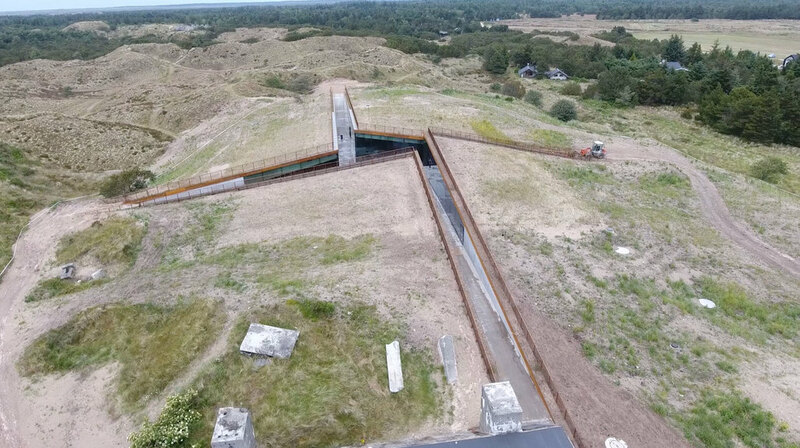 Upon arrival, visitors will first see the bunker until they approach through the heath-lined pathways and find the walls cut into the dunes from all sides and descend to meet in a central clearing. The courtyard allows access into the four underground gallery spaces that have an abundance of daylight even though they are literally carved into the sand. The exhibitions, designed by Dutch agency Tinker Imagineers, showcase permanent and temporary themed experiences that ground the tale of an impressive war machine. While set by the heavy hermetic object of the WWII bunker, the new TIRPITZ is a sharp contrast to the concrete monolith by camouflaging with the landscape and inviting lightness and openness into the new museum.